The level 1 fomation addresses those who wish to advance a little more seriously in the world of the Bonsai and to begin to practise this art in a autonomous way. 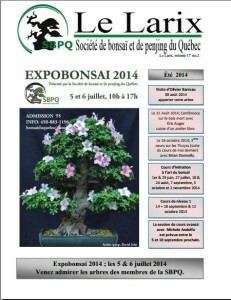 We recommend to the greenhorn to follow the initiation course in the art of the Bonsai first of all. In this way you will familiarized with the world of the Bonsai and see if you really like that before jumping more seriously in the level 1. This course is distributed on 3 days, that is 18 hours. Every day is separated in two and consists of a theoretical part and a practical part. The theoretical presentation is made on powerpoint and every student will receive pupil’s exercise book of 100 pages which corresponds with this presentation. Of more, the pupil will get full acces to the member zone where he will be able to get the note and other publication and information. The courses are given by experienced members of the society, having followed and successfully achieved the accreditation given by 4 years of the courses in the Andolfo school. Besides, an assistant also a student of the Andolfo school, comes to help the learning and to supply a support for the practical parts. You can reserve your place right away by using our inscription form. If you have questions or need other informations, do not hesitate to contact us here. In its mission to promote the bonsaï across all Québec, education and transmission of knowledge is primordial. The society offer lessons of all levels being suitable as well for the beginner as for the advanced bonsaïka!